Call it bovine boating. In honor of the Northern Forest Canoe Trail’s 15th Anniversary, Wenonah Canoe and Wood and Wood Sign Systems created a custom-made “Cownoe” canoe to support the Northern Forest Canoe Trail’s efforts to increase paddling opportunities in northern Vermont along the Missisquoi River. 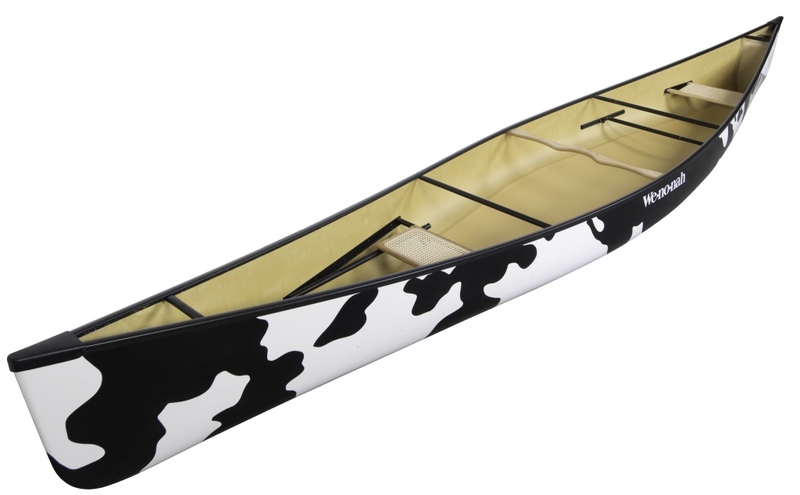 The Wenonah Cownoe will debuted June 6, 2015, in the state’s longest parade at the Vermont Dairy Festival in Enosburg Falls, as part of the Upper Missisquoi & Trout Wild & Scenic Rivers float. The Cownoe will be on tour this summer at the “Celebrate the Missisquoi” Speaker Series, talks that share local organizations’ efforts to improve water quality in the watershed. The series also promotes recreation events occurring this summer along the 80-mile long Missisquoi River. For event details visit www.celebratethemissisquoi.com. In other Upper Missisquoi news, on June 6, community members and partner groups celebrated the designation of the Upper Missisquoi and Trout rivers as National Wild and Scenic Rivers. Forty other states have rivers listed under the Wild and Scenic Rivers System yet these are Vermont’s first to be given this prestigious recognition. Congressman Peter Welch and spokespersons for Senator Leahy, Senator Sanders and the National Park Service spoke at The Abbey in Sheldon, Vermont alongside the Missisquoi River with a spectacular vista of Vermont’s Green Mountains. “The Missisquoi and Trout rivers are remarkable natural and cultural resources. This important designation will ensure future generations of Vermonters will enjoy these natural treasures,” says Congressman Welch. Designation under the Wild and Scenic Rivers Act protects the natural, cultural and recreational qualities of the Upper Missisquoi and Trout rivers, providing support for local efforts to increase recreational access and enabling continued enjoyment by fishermen, hunters and paddlers. The ceremony included speakers, live music refreshments and more, with more than 25 exhibitors sharing information about the rivers and natural landscapes of the region. A 6-mile paddling trip hosted by Northern Forest Canoe Trail honoed the designation and the organization’s 15th anniversary on the Missisquoi River from Davis Park in Richford to the confluence of the Trout River in East Berkshire. “Northern Forest Canoe Trail has worked in partnership with communities along the Missisquoi River since 2000 to improve access to recreational paddling for locals and visitors alike. This national recognition is a great achievement for all of us in the watershed in sharing the story of the natural and recreational resources in the region with a national audience,” adds Karrie Thomas, executive director of the Northern Forest Canoe Trail.